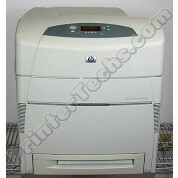 The HP Color LaserJet CP5225dn series is a large, speedy color printer, perfect for small workgroups. Our refurbished CP5225dn includes a duplexer for two-sided printing, plus a built-in Ethernet port for connecting the printer to a network. This is a large printer; ships on a pallet via freight. 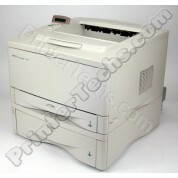 The HP Color LaserJet CP5525dn series is a large, speedy color printer, perfect for small workgroups. Our refurbished CP5225dn includes a duplexer for two-sided printing, plus a built-in Ethernet port for connecting the printer to a network. This is a large printer; ships on a pallet via freight. 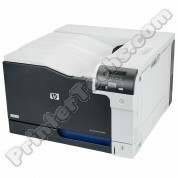 The HP Color LaserJet M750dn series is a large, speedy color printer, that can print paper sizes up to 11"x17". Our refurbished M750dn includes a 250-sheet paper cassette, a duplexer for two-sided printing, plus a built-in Ethernet port for connecting the printer to a network. This is a large printer; ships on a pallet via freight. No longer available. 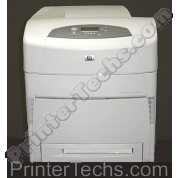 See the LaserJet 5000, 5100, or 5200 series printers as recommended replacement models for 11x17 printing. These printers handle more paper sizes, including 11 x 17, and offers great-looking 600-dpi output with Resolution Enhancement technology. 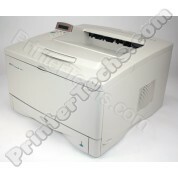 These 11"x17"-capable printers are popular for screen printing & CAD drawings. 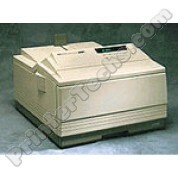 The base model includes 4MB RAM and 1 250-sheet cassette. The 11"x17" - capable LaserJet 5000 is a workhorse printer. This model includes a 250-sheet tray plus an optional 500-sheet feeder. This popular 11"x17" - capable printer includes a JetDirect card for connecting to a network, 12MB RAM, and a 250-sheet tray.